Being in the moment means being present in your body, now. What many call mindfulness is really a form of of physical presence. If you're born under the sign Taurus or Taurus rising, you may be wondering what's next. Your chart looks a little like the fireworks shed about three minutes after it's caught fire. There's hardly any smoke, but a lot is about to happen. Hand-drawn chart of your INVOLUTION reading for Taurus. You can feel it; you know that you're on the verge of birthing something entirely new about yourself, and it may seem to be taking forever. If anyone embodies the INVOLUTION idea that "the revolution is within," that would be you. 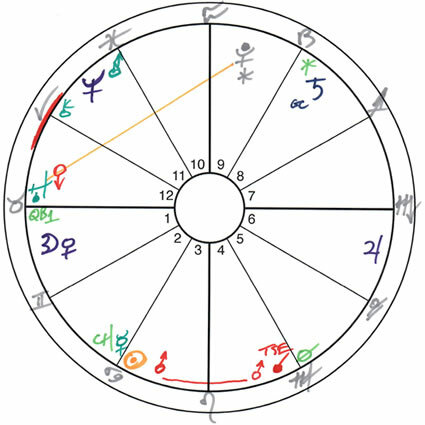 In your INVOLUTION spring reading from Planet Waves, I'll be looking first at your solar 12th house, which is Aries: the home of the Uranus-Eris conjunction. This email is just a preview -- you may pre-order all 12 signs here, or choose individual signs here. The key to your astrology is keeping your mind off the future, for now, and focusing on the present. I don't mean living as if there's no future. This is about preparing for the future, and ushering it in more gently. The thing to remember is that all of what you're "about to become," you already are. The only question is one of emphasis. Think of it this way. Any great artist contains the potential do many things, and could do them at any time. Yet you cannot do everything all the time. Any one creative project is a sampling of everything that's possible, and represents those possibilities. So, despite some of your very best and most radical potential lurking slightly in the future, you can be the full embodiment of that potential today, right now. Being in the moment means being present in your body, now. What many call mindfulness is really a form of physical presence. It's not a spiritual abstraction or esoteric Zen teaching dug out of a second-century Chinese temple. Or maybe it is: the art of showing up for your experiences, bringing your body, your feelings and your determination to express who you are. Yet if this is a struggle, it's the same one that nearly all creative people experience, which is about being bolder with their self-expression. Even if you have no desire to be "creative," you are the one creating your life; you are your own work of art. The total solar eclipse of Aug. 21 takes you out to the edge of your comfort zone, and right up to the brink of where you hold back, or pull back. The eclipse is a reminder that you tend to go so far, and then retreat. The eclipse is calling you out of your shell, into a space where you're able to challenge yourself to do something genuinely new. More details are in your reading. INVOLUTION is one purchase per household; you may share your readings with the people closest to you. I'll have it in your hands soon. To get the best price, you may pre-order all 12 signs here; or choose individual signs here. 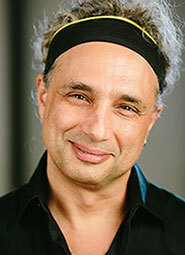 Thanks for trusting me as your astrologer, and for supporting Planet Waves.